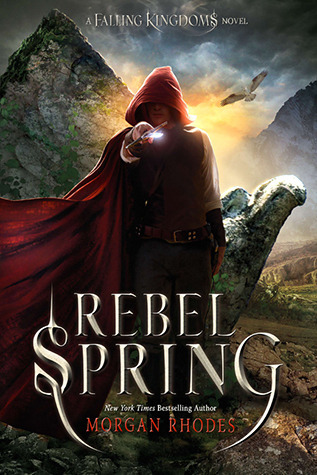 This is one of the best young adult high fantasy series I've ever read. I love that there is so much tension and build up and that we get to see everything that is happening while the characters are unaware. It makes the tension for us so high that we are reading on the edge of our seat. Once you start this one you can't put it back down and once you finish you immediately need to read the next book. This is one of those series that not a lot of people talk about but those who do, are so in love with it that they won't shut up about it once you get them started. The stakes are even higher this time -- which to be honest didn't seem possible after the end of FALLING KINGDOMS, yet Rhodes masterfully creates a world in which there isn't any rest for the good and the wicked are dreaming (mostly about Watchers). I was a little concerned during the first book that the "big bad" would be King Gaius, but I am really glad that there are more layers to this than what is obvious. With the introduction of new Watchers and a new prince from a far away kingdom, GATHERING DARKNESS promises to have the right amount of tension and confusion. I was a little put off by the fact that every girl immediately hated one another upon sight because of beauty. That is my only complaint in this one, otherwise everything was flawless. I liked that there was more death and disaster in this one and that we finally got to see more of the magic being used -- not just by Lucia but the magic in the world. I liked that there are rules and prophecies and I just REALLY like this series. The pacing for this one is so good because as it switches points of view, it also helps you realize how much or how little time has passed between events. As much as big casts sometimes cause problems because of their ability to make all characters seem the same, I think this cast has distinct voices and allows for the passage of time and location to happen seamlessly. Jonas grows more this time but like Cleo mentions, he stills acts the same way as he did back in the first book. He is so blinded by vengenance at some points that he can't see the bigger picture. But I think his little ... accident at the end will make him see the light. Magnus is finally being someone I can root for. I love that he admits that he is following his father's orders because he is scared for his life -- and that at the end he says eff that and starts to become his own man. Cleo is literally bae. I would sacrifice myself for Cleo's happiness. I also like that she is starting to research magic more and figured out so much about it!! That's all I will say on that one. Lucia is becoming so dark and twisted and I love it. I like that she's not completely good or evil but that she is a bit of both. I think where Magnus was doing as he was told because he feared for his life, Lucia does what she is told because she wants to use the excuse to do these ruthless things and I LOVE IT. I'm here for it. If you haven't started this series yet, why?? Start it right now. Meet these characters and fall in love with them. HEY! I'm literally checking on all blogs and you're my first one! First up, your blog is so nice and second, I can't wait to read the Falling Kingdoms series! I keep seeing this series around. Hopefully I get to it soon! I thought Falling Kingdoms was just okay, but your review makes me want to read Rebel Spring!